FAYETTEVILLE, Ark. 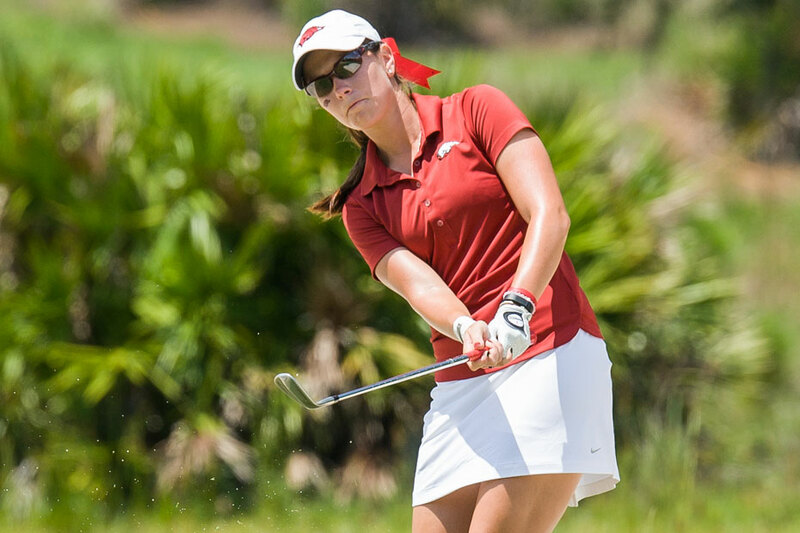 – University of Arkansas sophomore Samantha Marks returns to Northwest Arkansas this week to finish preparations for the Walmart NW Arkansas Championship Presented by P&G. Marks, who transferred to Arkansas for her sophomore season, earned a qualifying spot through a partnership between Razorbacks women’s golf and the #NWAChampionship. The criteria included team rankings, scoring averages and academic standings. This is the eighth consecutive year the Razorbacks have had at least one current team member in the Monday qualifier. Marks, along with Razorback teammate Regina Plasencia, play Monday in afternoon tee times with the top one or two players moving on to the event on Friday. Only one player, Kelli Shean in 2009, made the cut out of Monday’s play to advance to the tournament. Marks finished her first season with Arkansas third on the team in stroke average. The Maitland, Fla., native played in every event with a 7503 average. She had 10 rounds of par or better and posted three top-10 finishes for the Razorbacks. She carded a career-best 65 in the third round of the Schooner Fall Classic en route to a tied for ninth place overall and an Arkansas best 208 for the three day event. Plasencia was also a part of the qualifier last year and teammate Gabriela Lopez earned her third consecutive sponsor’s exemption and will play on the weekend. For more information on Arkansas women’s golf, follow @RazorbackWGolf on Twitter. For more information about the event, log on to www.NWAChampionship.com.